For the morning Seder Chassidus, the Bochurim will be exploring the famous “Inyana Shel Toras Hachassidus” (On the Essence of Chassidus) which is based on a Mammar delivered by the Rebbe on the Chassidic Holiday of Yud-Tes Kislev, 5726. It is a deep and searching inquiry into the central core of Chassidic philosophy and practice, and is not only an introduction to the subject but also an integral part of Chassidic literature. In it, the Rebbe defines the relation of Chassidus to the other parts of Torah, and the traditional levels of interpretation; to Kabbalah; to the levels of the Soul; to the concept of Moshiach; and to the attributes of Hashem Himself. He explains the function of Chasidus in the world and the imperative reasons for its dissemination. Taught by Rabbi Zalman Friedman. A subject all too taken for granted the avoda of Davening to Hashem every day is so integral to how the rest of the day will evolve. It is surprising how such an important aspect of serving Hashem is not focused on and learnt about more in Yeshivos. Davening is a skill, an art, and a unique way and time to connect with Hashem Himself. The more we understand, at least the basic Pirush Hamilim, and the core concepts of Tefillah, the more we appreciate the opportunity, and tap into its endless treasure and power. Humbly standing before Hashem is intended to change a person’s whole outlook on life, thereby enabling him to redefine his individual identity and purpose. This class taught by Rabbi Yona Schneck will explore the above, coupled with learning some Biur T’fillah al pi Chassidus. Review of general skills to identify elements on a daf Gemara, knowledge of Gemara vocabulary, expressions, rules, acronyms and Rashi script. Specifically with Mesechta Succah. Taught by Rabbi Yonni Schneck. In depth study of Hilchos Shabbos covering Kiddush, Hadlokas Neiros, Havdala, Muktza, Amira l’Adkum, Tircha, Hachono, Uvdin d’Chol and Molid and how these halochos pertain to contemporary issues. Overview and in depth study of the 39 Malachos and the elements which define the concept of malacha as recorded in Halachik literature. Also Halochos associated with T’fila. Taught by Rabbi Moshe Hildesheim. The essential course towards Smicha ordination is heavily based upon the texts of Shluchan Aroch, illuminated with the various commentaries including Shach, Taz, and B’eer Haitiv, as well as related Poskim with practical applications of the various aspects of Halacha and Minhag. After deliberate thorough learning and review of each section, students are given a Pre-test by Rabbi Levi Chazan, and then a Final test by Rabbi Elchanan Tauber. The Smicha ordination is granted to students who excelled in all areas, including attendance, diligence, participation, and of course test performance. Taught by Rabbi Levi Chazan. 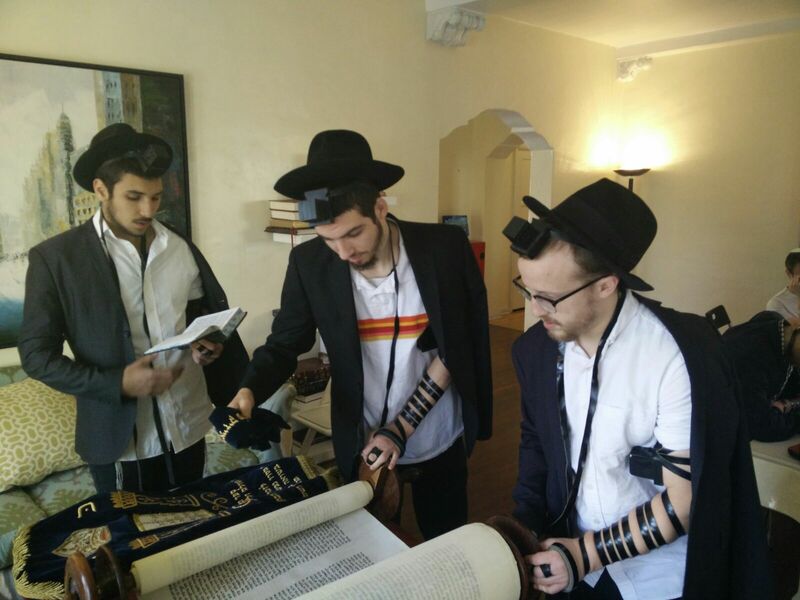 Students are offered choices between Chumash, Navi or Megillah, with Rashi or Meforshim. The exam evaluates a student’s grasp of the P’shat, and knowledge and synthesis of selected Rashis or Meforshim from each sefer, depending on the student’s individual capacity and interest. In this class you will study English Language Arts (or ELA). This is the study of the various sophistications of the English language. From using apostrophes in the correct way, to sentence structure and composition. Taught by Mrs. Leah Hoffman. In this class, you will study the practical mathematics. We focus on concepts like ratios, fractions, and percentages to ensure that you will have a well grounded understanding in the mathematics of daily business operations. This class includes; Math fundamentals, pre-Algebra, Algebra and Algebra 2. Taught by Rabbi Naftali H. Richler. Overview from the very beginning, the Creation of the world, with more focus on the era from the establishment of the Sanhedrin in Yavneh until the era of the Babylonian community, moving on to the destruction of the second Bais HaMikdosh until the 20th century. Taught by Rabbi Aryeh Hoffman. Often taken for granted that Yeshiva students have a clear understanding of the basic transition of the Written and Oral Torah Given by Hashem to Moshe at Har Sinai, all the way down to Halochos Paskened by Rabbonim in our times! Knowledge of the classic works in Jewish Tradition, from the giving of the Torah until recent history. Focus is on the works of the Torah in terms of its basic content and historical context, as well as the Talmud (Mishna, Gemara, Gaonim, Rishonim, and Achronim) essential books of law and Jewish thought and the major Rabbinical figures behind these works. For a pdf version of the daily schedule please click here. For TTI details click here.